The Chapel’s located in the rural area of S. Pedro de Avioso Portugal. The sleek line Chapel stands out for its constructive lightness. It’s elevated from the garden and paved areas around it by a concrete structure, which is inspired by the religious ascension, also underlined by the night lighting on its foundation. The exterior is coated with Thermowood 42×68 mm profiles, applied vertically and fixed to the cover slabs and floor by a metallic structure, in addition of being interconnected with each other by stainless steel rods, equally spaced, that ensures its stability. The way the exterior Thermowood is applied, is a tribute to the traditional agricultural granaries, typical of this territory. 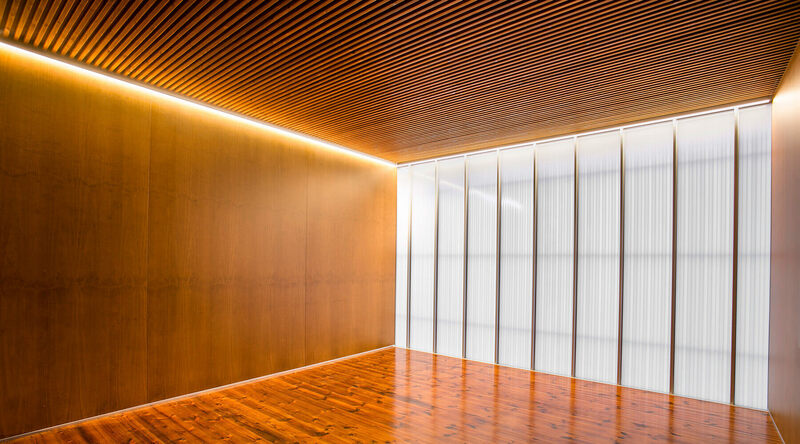 The gap between the Thermowood profiles allows the interior light to penetrate the building and the interior light to shine, at the same time creating an efficient shading of the polycarbonate panels of the exterior walls, avoiding overheating. 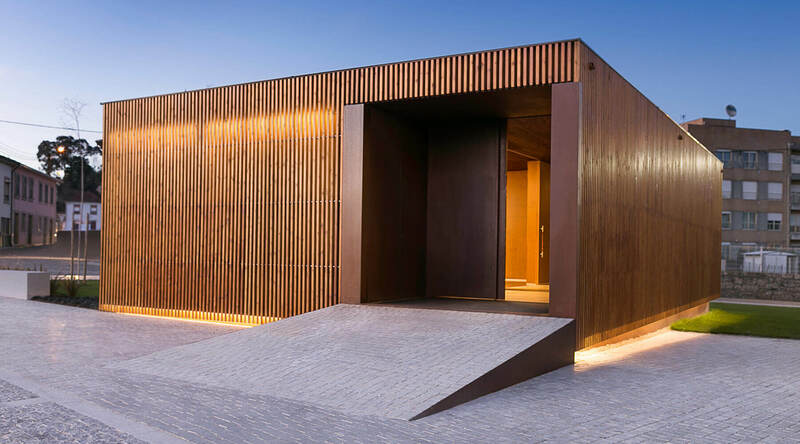 Regarding to the chapel’s entrance, the only access door, large and fully coated with Corten steel, it full fills the building chromatic uniformity, in harmony with the wood and concrete. 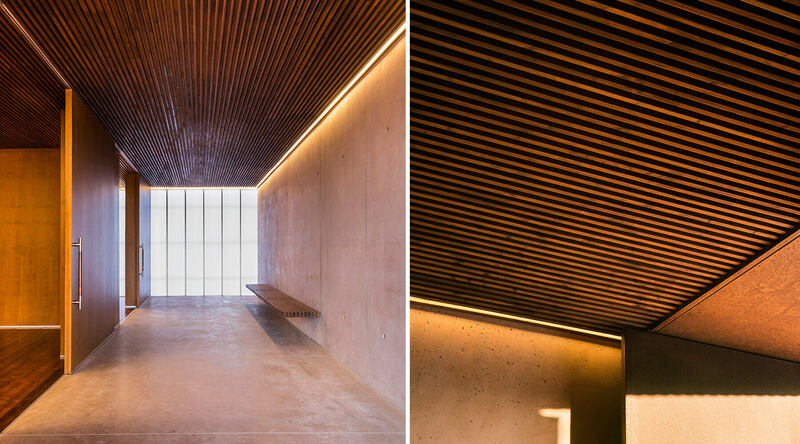 Regarding to the Chapel’s interior, the use of the wood predominates in the floors and wall cladding panels. 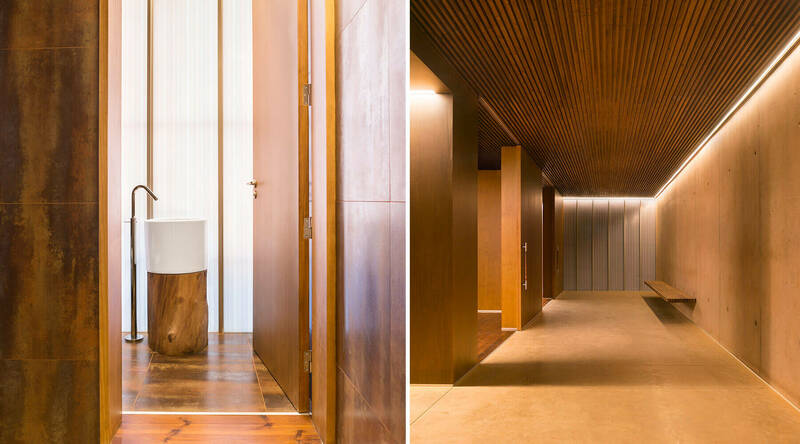 The use of wood in the interior improves the thermal and acoustic performance of the building. The aim to use Thermowood was to create pleasant feeling and to achieve balance in the interior together with colder materials such as concrete and polycarbonate.